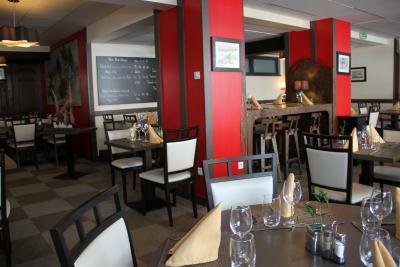 Lock in a great price for Hotel The Originals d'Alsace Strasbourg Sud (ex Qualys-Hotel) – rated 8.5 by recent guests! Location next to the tram station (20 min to Strasbourg), staff very friendly at the reception and breakfast. Great value for money. Will be back! We had a nice stay. It was well priced and a convenient short drive to the Christmas Markets that were the purpose of our trip. The staff was outgoing and showed a true desire to help us with information about the area and transportation available. The desk manager was so willing to help staff with English and our French was poor. We had several opportunities to have meals. Dinner was well presented and tasty. Breakfast I would say was the weakest of the meals but good. We also had desserts and coffee/tea one evening and they were excellent. The rooms are new and very nice. The a/c worked very well. Nicely decorated. It has onsite parking and you pay 7 euros. Helpful staff. Nice restaurant. Good but not great dinner. Good location if you are doing business nearby. Right next to the tram which was so convenient. Friendliest staff ever. Fabulous duplex room. bed is very comfortable. staff is indeed very friednly. The room is very big and comfortable. I really enjoy the time here. Will stay here again next time. Super kingsize bed. Neat, clean and usefully displayed room. Lovely to be at a 1'30 walk from tramway and for just 4€50 one can make his/her way round Strasbourg for 24hours. Tasty breakfast... a little pricy so. clean, comfortable and luxurious. We slept very well under very clean and white sheets. Well organised room with lots of space for your baggage and a spacious bathroom. Great that the toilet is separate from the bathroom. Excellent place appartment was clean and big enough for two persons. Staff was very helpful and professional. Had a very good experience. Clean, modern, functional, well maintained. Unusually friendly and helpful staff (they sent me home free of charge something I had forgotten in the room). Very quick service in the restaurant. Very well communicated with a tramway stop to the centre of Strasbourg one minute away. Excellent quality/price ratio. Enjoyed the stay: although part of a hotel chain, I felt as if it was a small hotel run by a family. 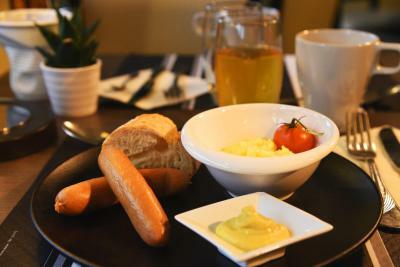 Located in the center of Illkirch, Hotel The Originals d'Alsace Strasbourg Sud (ex Qualys-Hotel) offers accommodations with a spa, just a 10-minute drive from Strasbourg-Entzheim International Airport. The hotel is a 3-minute walk from the Illiade Cultural and Conference Center. All the rooms feature WiFi and a flat-screen TV with satellite channels. 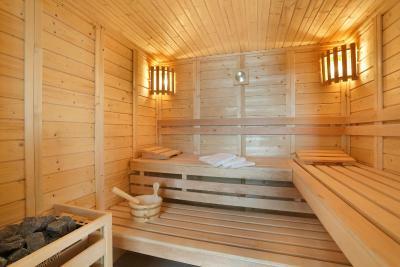 Each room has a private bathroom with a walk-in shower and a hairdryer. Buffet breakfast is available daily and can also be enjoyed on the covered terrace. 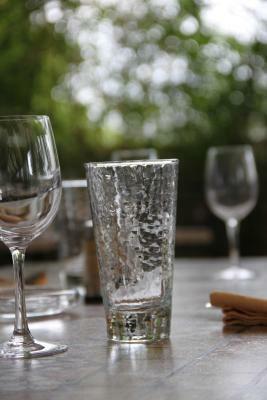 The restaurant serves specialties of the region, with set menus from Monday to Friday. There is also a bar. 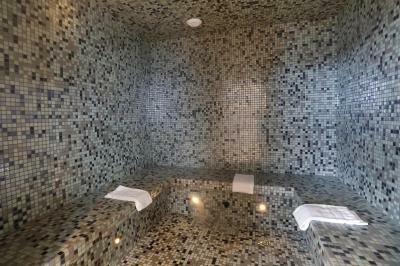 Guests have free access to the fitness room and spa, which includes a hammam, sauna, chromotherapy and light therapy shower. Meeting rooms are also available on site. Hotel The Originals d'Alsace Strasbourg Sud is set a 40-minute drive from Europa Park and 5.6 mi from Strasbourg Train Station. 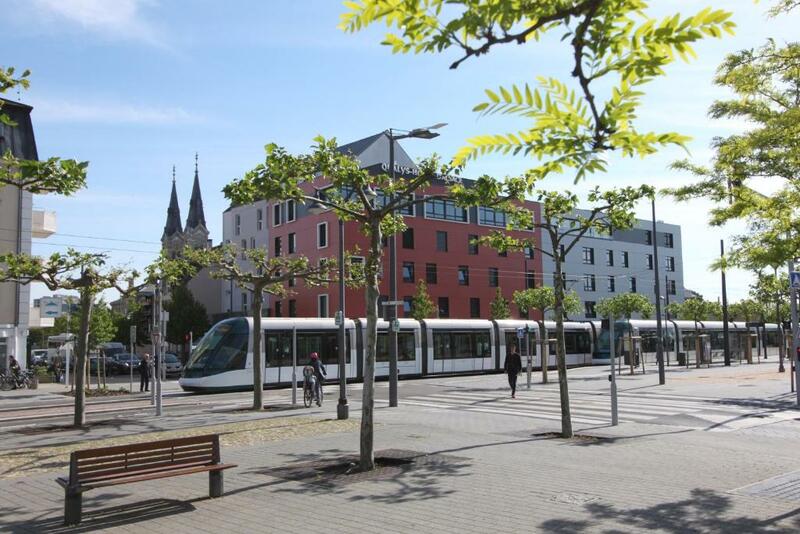 Cours de l'Illiade Tram Station is 50 feet from the property and provides direct access to the center of Strasbourg, Meinau Stadium and Strasbourg Train Station. 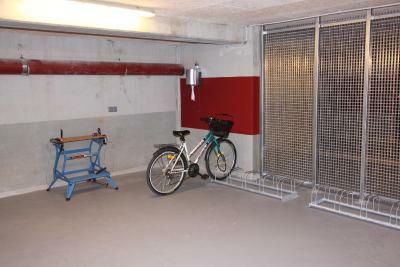 Private parking is available on site at an extra cost, as well as bicycle storage. 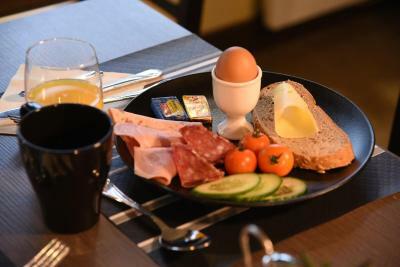 When would you like to stay at Hotel The Originals d'Alsace Strasbourg Sud (ex Qualys-Hotel)? This double room features a flat-screen TV with satellite channels. The private bathroom includes a walk-in shower, hairdryer and a separate toilet. A laundry service and massage service are available at an additional cost. This family room features a flat-screen TV with satellite channels. The private bathroom includes a bathtub, hairdryer and a toilet. Located in the new wing of the hotel, this room features air conditioning, a safety deposit box and a flat-screen TV with satellite channels. 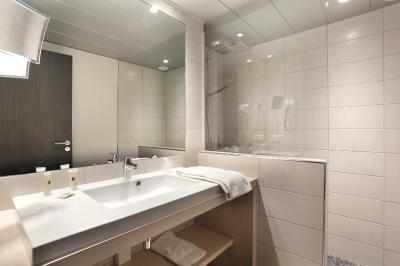 The private bathroom includes a walk-in shower, hairdryer, magnifying mirror and a separate toilet. Located in the new wing of the hotel, this room has a seating area with air conditioning, a safety deposit box and a flat-screen TV with satellite channels. 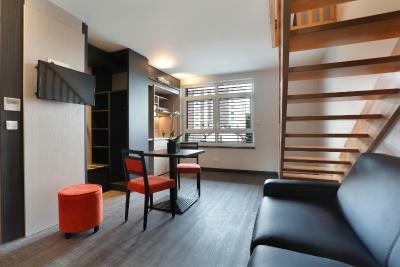 This soundproofed apartment features a sofa bed, a safety deposit box and 2 flat-screen TVs with satellite channels. A fridge and espresso machine are also featured. A kitchenette with microwave, stovetop and kitchenware is also available upon request, at an extra cost. 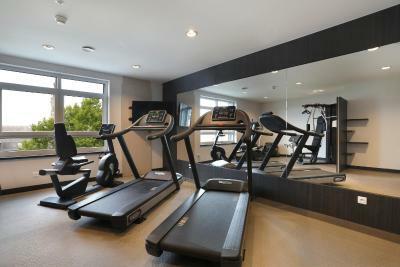 This larger soundproofed room has air conditioning, a safety deposit box and a flat-screen TV with satellite channels. This air-conditioned 1-bedroom apartment features a living area with sofa bed, a safety deposit box and 2 flat-screen TVs with satellite channels. A kitchenette with microwave, stovetop and kitchenware is also featured. House Rules Hotel The Originals d'Alsace Strasbourg Sud (ex Qualys-Hotel) takes special requests – add in the next step! Hotel The Originals d&#39;Alsace Strasbourg Sud (ex Qualys-Hotel) accepts these cards and reserves the right to temporarily hold an amount prior to arrival. Hotel The Originals d'Alsace Strasbourg Sud (ex Qualys-Hotel) accepts these cards and reserves the right to temporarily hold an amount prior to arrival. In case of arrival after 18:00 please contact the hotel in advance (the telephone number is on the booking confirmation). 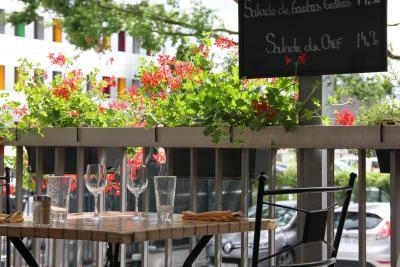 The restaurant is open during the week and can also open during the weekend upon reservation only . 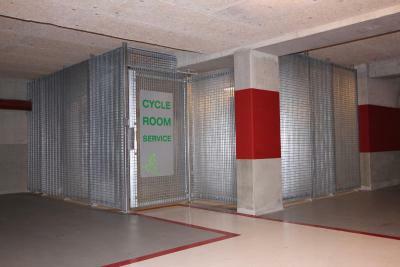 The hotel provides a free parking for bikes and motorbikes which has a shelter and is closed during the night. A charging station for electric cars is also available in the parking. 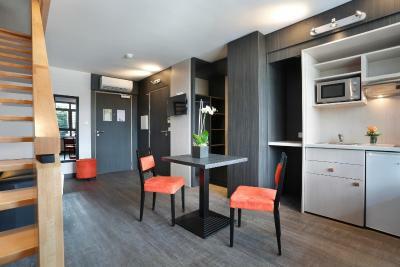 Please note that the kitchenette of the Duplex Room is only available upon request and at an extra charge. No fridge in the rooms. Breakfast seemed too spread to find items easily. One morning the eggs were undercooked. Long route through the building with either stairs or elevators is a bit inconvenient with luggage to some parts of the building. We would have liked a water boiler for a tea or coffee in the room. Breakfast was, for me, a bit expensive (12.90) for some read, some cheese and some sweet pastries. The room was excellent, super clean, and much bigger than expected! Great air conditioning, reception staff were friendly and helpful. 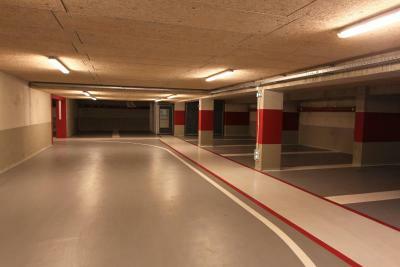 Easy to find and safe secure parking were great bonuses! We will be back to stay next year! The room was Great and enough space for a family with 3 children. The Tram is very close and with direct connection to Strasbourg City. The breakfast! For people without food problems it was chaotic. No jugs were labelled (was this hot water, coffee, tea, milk?). There was no information explaining anything so people who didn't know that you had to cook your own eggs were taking raw eggs - it was a scramble. On booking I'd requested gluten free and reminded reception on arrival. I was told that it wouldn't be a problem. When I arrived for breakfast there was no gluten free bread to eat and with other food issues, the only thing I could consider was yoghurt and apple puree. The receptionist listened apologetically to my complaint and refunded our breakfast costs, but instead of the relaxing, calm breakfast I'd experienced everywhere else, it was quite the opposite. It was in a brilliant position to get the tram into Strasbourg which took about fifteen minutes. I hadn't realised that Strasbourg was such a beautiful city. With very little time we took the last little train of the day from outside the tourist office that takes tourists round the city - it was wonderful. We got to see so much more than we would otherwise have done in the time. The reception staff were extremely helpful.